A large part of what Idea Management is about is the communities and people that produce the ideas – without them non of this would work. In the following page we discuss the techniques for modelling community created data to enhance contemporary Idea Management Systems. On one side the Idea Management instances achieve to collect large amounts of ideas and comments because its very easy to create this content for users but on the other hand later the analysis of all this information can prove very time consuming and diffucult. As one of the solutions to that we problem see the use of Natural Language Processing algorithms and specifically Opinion Mining. In our opinion automatic recognition of topics on which users comment and the emotions that they express about certain ideas can work as an additional ranking tool beside the traditional community up/down voting. In Gi2MO research we do not devote to creating accurate Opinion Mining algorithms but only on analysis of the metadata that is delivered during this process and the possible benefits that it can bring to Idea Management Systems. As part of Gi2MO research we investigated what kind of metadata to use and how to publish information about user opinions on the Web. 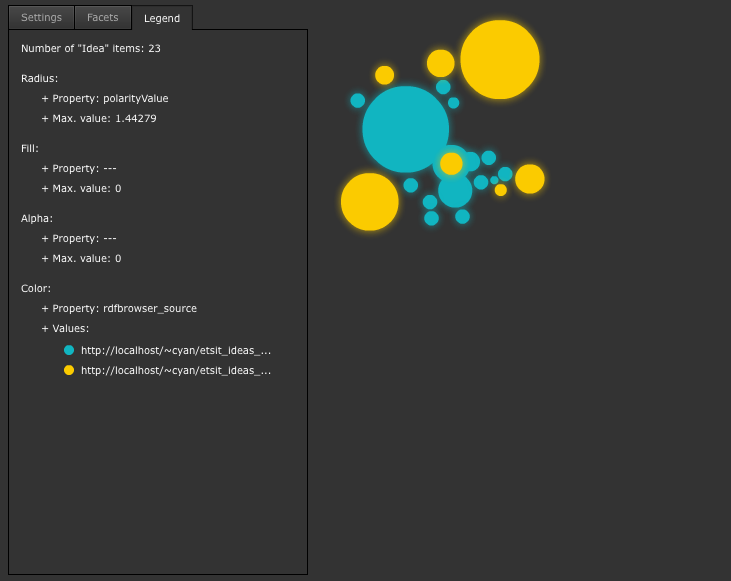 The result is Marl ontology and series of experiments that followed (see Marl use cases, Marl mappings experiments and Linked Opinion query experiments). The goal of Gi2MO ontology is to cover in a generic way the data derived from standard functionalities of Idea Management Systems. Therefore, for opinion polarity (good vs. bad), opinion value (quantified expression of the opinion) and the topic of the opinion we recommend Marl Ontology. This schema was designed specifically for such use and covers a variety of scenarios. 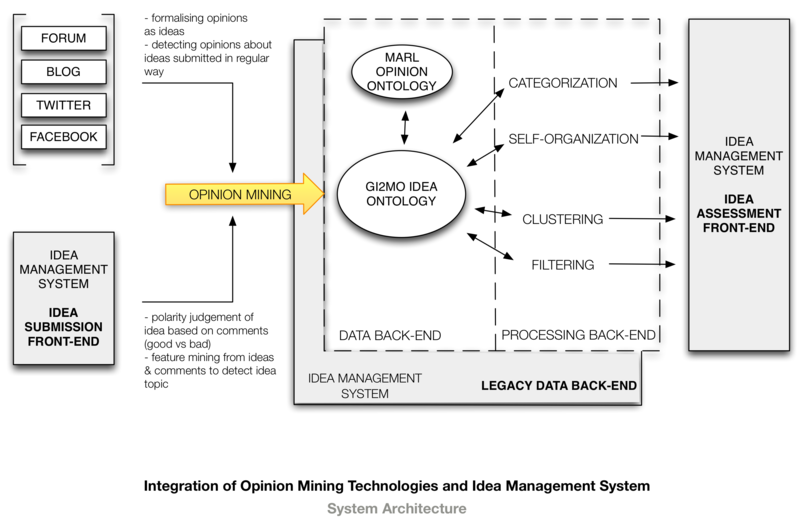 For Idea Management System the simplest case is to link and exploit opinions is by applying the Gi2MO and Marl ontologies together and link the opinions indirectly to ideas via comments. Gi2MO delivers the metadata that links comments together with ideas. The same link can be used to extract opinion value for each comment and aggregate the data. Marl provides a metadata class for this use called: marl:AggregatedOpinon. This class can be directly attached to the idea metadata. For a more sophisticated use opinions can be linked via the topics that they describe, e.g. the specific product that a given opinion describes. In both cases, establishing such links enriches the metadata structure of Gi2MO and enables to make queries related to opinion content of the Idea Management System user base (e.g. show all positive opinions on ideas related to given product, calculate amount of positive vs. negative opinions connected to given idea or idea category etc.). Context: One of the use cases that could prove the worthiness of Linked Opinions concept is integration of multilingual Idea Management instances that gather ideas on the same topics but from different audience. Real World Use Case: As an example we use our ETSIT Ideas instance that gathers ideas about improving the university school. Originally we had setup the instance for Spanish students of ETSIT school, however (particular for this experiment) we proposed a second instance in English for international students and interns that visit the university for short period. This way we end up with two systems gathering the exact same input but from different audience and in different languages. Problem: How to analyse and track all the data in one place and use a single analytical tool for joint analysis of the entire idea stream from both instances. attached to a particular idea – biggest spheres are ideas with best opinions, colours represent different systems/languages.